The following are three great ways to help homeowners keep water away from their homes foundation. 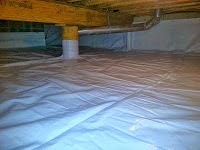 Which in return will aid in keeping your crawlspace or basement dry and your foundation from potential settling issues. On a 1200 sq.ft. home, the roof alone produces about 750 gallons of water per 1 inch of rain. That is a lot of water for any gutter system to handle. So when a gutter system starts to get clogged with leaves, branches, etc.. the runoff water from the roof has no where to go but over the sides of the gutter, falling to the ground next to your homes foundation. This can cause large amounts of excessive water to run down the backside of your homes foundation, seeping into the blocks, or cracks, or possible overloading an existing drainage system that was not designed for so much water capacity. To insure this doesn't happen to you, periodically check your gutter system for any debris. Using the above statistics on gallons of water per inch of rain your roof can produces, you can imagine the amount of water that runs through your downspouts. Homes that have downspouts dumping right next to the foundation are at risk for not only unwanted water penetration into their basements or crawlspaces, but also potential settling issues. Extending downspouts away from your homes foundation can in some cases dramatically drop the amount of water penetration into your basement or crawlspace and aid in the prevention of future settling issues. Their are many methods a homeowner can consider when deciding on how best to extend ones downspout. In my opinion the most effective method would be to run your downspouts into a solid PVC line installed 4"-6" under ground. This PVC line would run out 10'-12' into a bubble or small dry well of some sort. This would accomplish the goal of keeping water away from the house and at the same time eliminate the headache of having to move your extension for various reasons, such as mowing the yard. I prefer PVC instead of the standard black flex tile because if by chance leaves and debris block the downspout extension, PVC lines are proven much easier to snake out than it's black flex tile friend.